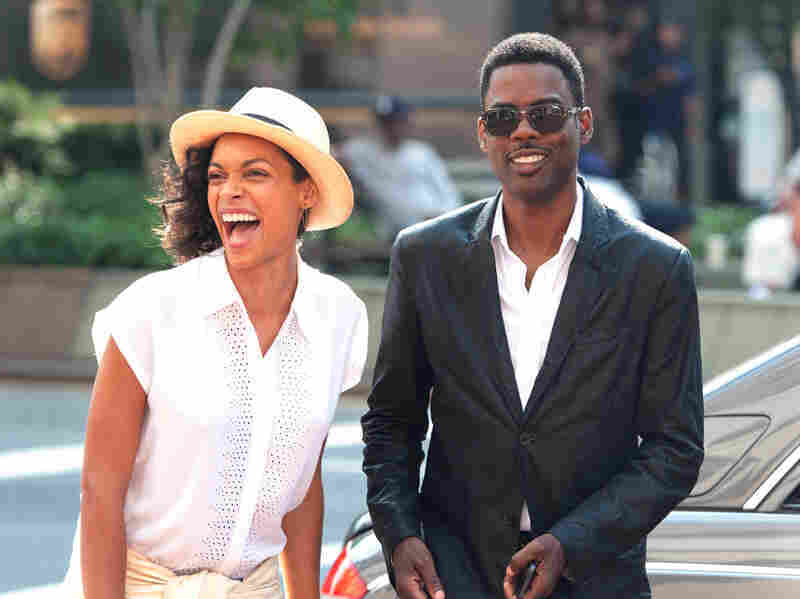 'Top Five': A Good, Not Great, Day In New York With Chris Rock Chris Rock's new comedy is strong on industry satire, but gets a little watery with the romance. Rosario Dawson (left) plays Chelsea Brown, a New York Times reporter who spends a day interviewing Rock's character, Andre Allen. Chris Rock has been on a tear — a widely shared interview with Frank Rich in New York Magazine, a widely shared guest column in The Hollywood Reporter, interviews with Audie Cornish on All Things Considered, Terry Gross on Fresh Air and Jesse Thorn on Bullseye. And those are just a few of the many conversations he's had surrounding the release of his new film, Top Five, which he wrote and directed. In a lot of those discussions, Rock has had a lot to say about race in Hollywood, race in general, the atmosphere surrounding comedy, the intersection of some of these things with gender and class, and a whole lot of other pretty provocative things. So it might be that I went into the film primed to be more interested in what it had to say about the industry than in its central love story. Top Five follows a comic movie star, Andre Allen (Rock), as he spends a day being interviewed by Chelsea, a beautiful reporter from The New York Times, played by Rosario Dawson. Early on, they have a fascinating and tense relationship, marked by distrust and the blend of false and real intimacy that develops as she interviews him for her story. Allen is about to marry a Bravo reality star (Gabrielle Union) in a splashy, highly publicized event, and he's simultaneously promoting his first serious film, a drama about a slave rebellion. The best parts of the film lie in its industry satire: its portrayal of the terrible rote interviews that take place at junkets, its sharp eye for the bad questions asked by lazy entertainment reporters, and little details like the satellite radio engineer — played by straight-up genius Brian Regan — who tries to goad Allen into being more painfully wacky while doing station promos. Rock is great at giving Andre's frustration a genuinely pained edge, alternately funny and not, and that comes both from his performance and from his careful maintenance, as the director, of the balance in the film's tone between goofy comedy and a comedic presentation of some of the same observed and thoughtful criticism he's been offering in the press in recent weeks. Along the way, there are quite a number of good performers in small roles, including but certainly not limited to Kevin Hart and J.B. Smoove as members of Andre's team, Cedric the Entertainer as a guy he encounters at a particularly bad time, and few folks playing themselves with gusto in cameos. Gabrielle Union is both very funny and oddly sympathetic as a woman whose life has become a gross pageant she now believes it only makes sense to continue making. What's disappointing is that what begins as an unconventional relationship of uneasy respect between Andre and Chelsea eventually turns, as I kept hoping it wouldn't, into a much more conventional and much less interesting road to possible romance. Her boyfriend is dispensed with by way of a hackneyed plot device, and the two of them then are given a thoroughly implausible reason to fight, and by the end, it felt like the movie Rock cared about more had been abandoned in favor of this story that doesn't have nearly the same tension or attention to detail. Dawson is excellent, particularly in the early scenes: their chemistry is such that just the two of them talking would be a perfectly good movie, like Before Sunrise. But something is gradually lost as she becomes a much more run-of-the-mill love interest with much less to say. To be clear, Rock doesn't have a special obligation to do social criticism in his movie just because he's been doing it in the press; it's more that the film gets all its energy from satire that's strong in the beginning and loses steam as he goes. And the romance that's ramped up to provide the movie with a direction in its final act is conventional and undercooked. It's fun to watch Chris Rock; it's just fun. And there are parts of this film where it's fun to watch him in exactly the ways he wants it to be. (I don't happen to think the movie's abundant super-raunchy jokes are as funny as it thinks they are, but opinions on that will vary.) But there is a story here about Andre's tenuous professional and personal situation that I think I wanted to see more than I wanted to see a romance between these particular people. The movie makes for an enjoyable enough day in New York with good company, but by the end, it's lagging.